An audio drama adaptation of Bram Stoker’s little-known prelude to his famous horror novel. The Good, the Bad, and the Vlad face off in one of old Germany’s forgotten valleys for the soul of a very foolish Englishman. Ironically, only the use of classical music mars Titania Medien’s otherwise classic production. Adapted from the short story “Dracula’s Guest” by Bram Stoker, published posthumously in Dracula’s Guest and other Weird Stories in 1914. Directed by: Stephen Bosenius and Marc Gruppe. Try before you buy: A short excerpt featuring Jonathan Harker making his colossally stupid decision to tour a spooky, abandoned town on Walpurgisnacht can be heard at the link below. Es ist Walpurgisnacht! Bedenken sie! Walpurgisnacht! It’s Walpurgis’ Night! Think about it! Walpurgis’ Night! I’ll be frank: I’m tired of Dracula audio dramas. There have been plenty of English and German productions already, and I’d bet my not-very-sharp canine teeth that more are on the way. Sigh. The only thing less original than adapting Dracula is reenacting, “modernizing”, or parodying Orson Welles’ one trick pony, The War of the Worlds. It’s been done, folks. Hell’s bells, even I did one for my local station back when I was a teenager. I have nothing against amateurs doing War of the Worlds riffs – I have nothing against amateurs doing whatever they want, so long as they don’t charge for it – but for professionals, it’s well past time to move on. But Dracula’s Guest? Now this is more like it. Bram Stoker’s neglected little gem relates the story of what happened to Jonathan Harker en route to his fateful first meeting with Count Dracula. Some scholars believe this short story was supposed to be the first chapter of Stoker’s famous novel, others disagree. Titania Medien has sided with the first group, making Dracula’s Gast the opening act of its Dracula adaptation. In doing so they’ve finally given this short, atmospheric work its due. Stopping in Munich on his way to Transylvania, Jonathan Harker (Simon Jaeger) decides to take a day off to enjoy the German countryside. Innkeeper Dellbrueck (Heinz Ostermann) nervously assents, assigning Harker his faithful coachman Johann (Christian Rode), and urging that he return before night falls. There’s a hint of snow in the air, you see. It also happens to be Walpurgisnacht, that Pagan holiday when the dead rise from their graves. Harker responds with a young man’s impetuousness and an Englishman’s skepticism. He dismisses Johann’s backwoods superstitions, saying he’ll tackle the valley on foot and return in his own good time. Reluctantly the coachman takes his leave, asking God and Mary to watch over Harker. Someone is indeed watching over Harker, but it isn’t God. A dark silhouette observes him from afar, and a strange white wolf tracks his every move through the valley. Of course, things get worse from there in this cautionary tale. The weather turns, and the sky darkens with the onset of a sudden winter storm. Harker is haunted by disembodied female laughter. Seeking shelter from the cold, he makes his way into the abandoned town and is inexorably driven into the mausoleum of Countess Dolingen. Her malevolent presence teases and drives him on, and Harker seems doomed to reawaken the Countess and become her first meal. But Harker is working for an extraordinary patron, and Dracula is not one to cross. Titania Medien has set out to create the definitive hoerspiel library of horror classics through its Gruselkabinett line, of which Dracula’s Gast is the 16th release. I’m fond of the line for its high standards and its willingness to tackle titles that are off the beaten path (like Dracula’s Gast) in addition to more well-known material. 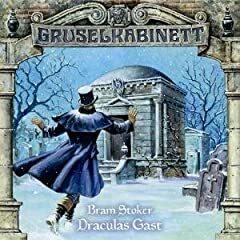 Although not every production has been stellar, Dracula’s Gast has all the hallmarks of Gruselkabinett’s strongest releases. The casting is rock-solid, filled in the German manner with actors known and advertised by the American and British Hollywood stars they dub. The CD’s back cover tells us that the all-star cast of Dracula’s Gast features the German voices of Heath Ledger, Ian McKellen, Halle Berry, Christopher Lee, Michael Caine, and Scarlett Johansson. Simon Jaeger (the Heath Ledger guy) gives Jonathan Harker, a vanilla character at the best of times, the bravado and vulnerability of youth. This is really Harker’s story, saved from being a monologue only by numerous flashback scenes that detail the origin of his business trip and his relationship with Mina Murray (Tanja Geke). Everyone performs well in these supporting roles, but Juergen Thormann’s (the Michael Caine guy) Peter Hawkins was particularly memorable for the naturalness of his fatherly warmth for Harker. Joachim Hoeppner’s courtly, hard voice makes him a fine Dracula, but those wishing to hear the Count in action would be better served by Gruselkabinett’s full Dracula adaptation. The Count’s appearance in Dracula’s Gast accomplishes all it needs to, but fans are duly warned that it is brief. If the production has one flaw, it is its use of classical music. Bosenius and Gruppe opt to use Paul Dukas’ well-known “Sorcerer’s Apprentice” as a leitmotif, weaving snatches of it throughout the drama, right up to the famous BUM BUM BUM BUM! of the finale. The supernatural aspect of “The Sorcerer’s Apprentice” would seem well suited to a play about vampires, and Paul Dukas is almost certainly a more accomplished composer than Titania could have hired. So why doesn’t it work? Audio dramatists would do well to remember that music is a storytelling device, not just an atmosphere generator. This is particularly the case for works like “The Sorcerer’s Apprentice”, which was written as a musical adaptation of Goethe’s 1797 poem, “Der Zauberlehrling”. The true genius of “Apprentice” is how Dukas caught the spirited, macabre humor of Goethe’s poem and put it into his music. Walt Disney’s Fantasia segment with Mickey Mouse didn’t put any comedy into the “Apprentice” that wasn’t already right there in the musical notation. Quite the opposite; Mickey’s battle with the brooms works because it draws its jaunty horror straight from Dukas’ score. Unfortunately, Goethe’s / Dukas’ humor really has no place in the humorless Dracula’s Gast. Placing the wry concluding beats of “The Sorcerer’s Apprentice” at the end of Stoker’s tale makes it sound as though Bosenius and Gruppe are winking at the audience, turning the macabre tale into a weird jest. Since the dark events of Dracula’s Gast immediately precede those of Dracula, a chill of foreboding would have been more appropriate. Gruppe and Bosenius didn’t overlook this problem entirely, because they used dark, synthesized tracks for the play’s more overtly sinister scenes. While this original music is aesthetically unremarkable, unlike Dukas’ famous work it fits the story Dracula’s Gast actually tells. In short, Dukas’ “The Sorcerer’s Apprentice” is musically superior but dramatically out of context. I’m hardly the first person to say this: many German fans have complained about the jarringly inappropriate use of classical music in the Gruselkabinett line. And in all fairness, Dracula’s Gast is more successful in its implementation of classical music than other releases have been. In Titania’s Dracula adaptation, for example, the vampiric resurrection of Lucy Westenra is accompanied by Claude Debussy’s 1894 Pr?lude ? l’apr?s-midi d’un faune, which, like “Apprentice”, was based on a poem (by St?phane Mallarm?, c. 1876) with a very different theme. Although both works concern supernatural creatures and have sexual overtones, the horror of Lucy’s return fits poorly with the benign wonder of Debussy’s light reverie. Quite simply, the script and score tell different, incompatible tales. Rather than lending their dramas a patina of class, Gruselkabinett’s line-wide use of classical music feels unnecessary, distracting, and ingratiating. Classical music aside, ultimately Dracula’s Gast succeeds on sheer atmosphere. Stoker’s tale is as much about Winter’s sudden power to transform the familiar into the foreign as it is about the undead. As such, Dracula’s Gast is genuinely “unheimlich”. This German word literally means “un-home-like” (as homes are what are most familiar to us, and most disturbing when they are rendered alien), but it is generally translated in English as “uncanny”. In the later pulp circles of Lovecraft this kind of story would be coined “the weird tale”. Dracula’s Gast may not have the same strong characterization, clever plotting, or even stark chills of Stoker’s more famous novel, but it still appeals to our terror of what is both ever-present and ever-strange: the land of the dead we coexist with every day.